reusable sammy baggies in my recent post and thought, "Hey, I could do that! ", you'll want to check out these instructions on How To Make a Reusable Sandwich Wrap. 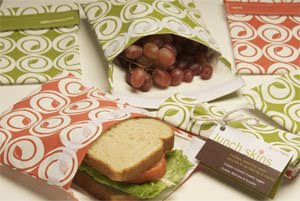 According to the website, these "fun, functional sandwich wraps give you a reusable alternative to plastic baggies, plus they are a snap to make. After each use, they can be wiped clean with a damp cloth or tossed in with the rest of the laundry." I don't know about a snap (I routinely sew my sleeves together trying to make a napkin), but they sure are cute! The lovely people at LunchBots asked if I would give their product a try, so today I put their containers through the ol' shmoo review. I was babysitting today, so rather than making lunch for my grumpy preteen shmoo (I'm tempted to call him poo-poo shmoo...) I made lunch for my lovely little niece, Summershmoo! Summershmoo is four years old and a princess-lovin', pink-wearin' girly girly girl. Therefore it's full-throttle cuteness today, starting with a Peanut-Butter Panda: I used cookie cutters and whole white wheat and regular whole wheat bread to make a panda filled with peanut butter and agave. The eyes and mouth are bits of grape fruit leather. 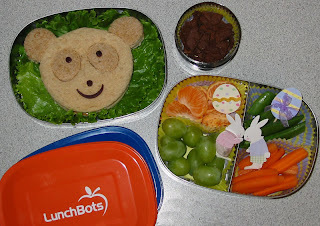 I used cupcake liners and Easter cupcake toppers to make the second LunchBot pretty (I trimmed the pointy ends off the toppers with sharp scissors). Summershmoo is very picky when it comes to fruit; I decided to find out if grapes and mandarin segments would work for her. But I know she loves sugar snap peas and baby carrots. For dessert I continued the Easter theme with a container of Annie's Chocolate Bunny Grahams. Verdict: Summer was thrilled with everything and immediately ate first the sugar snaps and then the baby carrots. She nibbled on the lettuce before eating most of the panda san ("Can I eat his mouth? Can I eat his ears? Can I eat his eyes?") She put a mandarin in her mouth and took it out again and maybe ate a couple grapes, then shared the bunny grahams with her little sister. 4 stars. And the LunchBots? You can see from the picture that they come in two styles: one is big enough to fit a sandwich, the other has a permanent divider down the middle, for snacks and smaller items. Both have tight-fitting stainless steel lids; the lids are quite snug (but not water-tight) without any latches to hold them in place. I was worried that small children wouldn't be able to get the lids off, but both my son and my niece got them off without any trouble. I think the size is just right for a bento-style meal or for a child with a smaller appetite. Spontaneous Contest: Who else would like to give LunchBots a try? (I like them, I just have a cupboard filled with lunch boxes.) Email me with your name and address -- first one gets the set! UPDATE: Wow, I think that took less than a minute. They're gone! We've been served! As of today there is no excuse for using disposable plastic baggies anymore, because there are now at least a gazillion reusable alternatives. 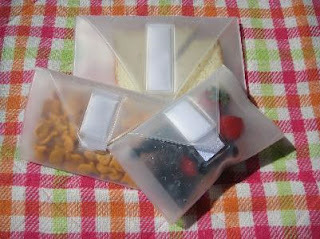 The latest one sent in to me are these clear Fresh Snack Packs. 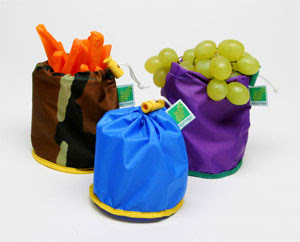 As the site says, they are "PVC-free EVA plastic, phthalate free, BPA free, and lead free". They come in sandwich and snack size, and I like the way they double-wrap; I imagine that helps keep things well-sealed and fresh. I'm sure there are even more reusable baggies that I don't know about yet. If you know of one, tell us about it in the comments. My Brand New Baby Blog! Hey, have all of you heard of This Is Why You’re Fat? If not, go take a look. I’ll wait. Back? The site is getting a lot of press lately. Obviously it’s meant to be funny and outrageous – people send in their craziest junk-food creations and we all groan and laugh. Bacon-topped Krispy Kremes for everyone! "It’s so gross, but now I want some." "Eeeew! Oh, I bet that tastes good." "That’s a heart attack waiting to...mmmm, bacon." Isn’t that interesting? At the same time that we’re appalled, these images are sinking into our little monkey minds and triggering cravings for these kinds of foods. (Who doesn’t love a deep-fried somethin’ on a stick?) Perhaps we even feel a sense of community and warped pride in this type of county-fair, deep-fried, all-American garbage. So I started thinking, what if, instead of looking at images of junk food every day, we served ourselves up a daily helping of healthy images instead? Can healthy images trigger the same reaction but in reverse? Can they inspire us to better health, make us crave a colorful salad, or help us get to the gym? That’s why I created a new blog called This Is Why You’re Thin! The goal of the site will be to encourage exercise and the consumption of healthy plant-based foods through fun, intriguing, and beautiful images that will inspire us all. I’m looking for inspiring photos or video links of the things you do for health: pictures of fresh fruits and vegetables...beautiful bean soups or hearty wholegrain bread...people running, climbing, swimming, stretching...smiling kids drinking smoothies and picking strawberries. Find out how to contribute by clicking here. 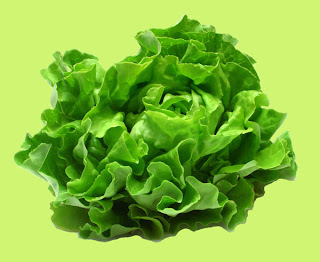 Salad, salad, salad, is that all you ever eat for lunch? Yep, pretty much. But gosh darn, I like it! 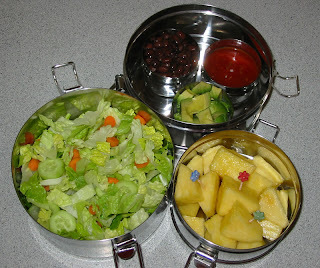 Here's the salad-of-the-day in my two-tier To-Go Ware tiffin. I'm so happy that To-Go Ware has added little Sidekick containers to their line. The lids are stainless steel (no more crying over cracked plastic!) and they fit snug; I haven't had any leak problems. I used three today to hold black beans, picante sauce, and half an avocado to top my salad with at lunchtime. I love the way they all fit in the tiffin. Shmoo has now proclaimed that he "only eats pears" and has stopped eating all other fruit. ("Who are you and what have you done with my son?") I tried to tempt him with some of this fresh pineapple, but ended up eating it all myself. I packed it in the smaller top container from the three-tier tiffin -- it can be packed and used alone for small snacks. And look at the pretty food picks I found to eat it with! I've been feeling so good lately! I've been improving my eating style and getting back on track with Eat To Live, with the help of my wellness coach, a personal trainer (basically I need people telling me what to do at all times or I wind up face first in a vat of pudding), the support of my friends, and a lot of hard work. A green smoothie for breakfast. A small snack if necessary (usually a piece of fruit). A big salad with different toppings, some steamed vegetables, and fresh fruit for lunch. A snack if necessary (usually fruit and an ounce of nuts, or a slice of sprouted wheat bread with almond butter). A big bowl of soup or stew, cooked vegetables, or a stir-fry for dinner. beans are in there at least once a day, at lunch, dinner, or both. What have I modified? Dr. Fuhrman advises people not to snack, but I find I get too hungry and fall off the wagon if I don't get those snacks. So I snack. I also use a bit of olive oil at times, and I sprinkle salt on something if it means the difference between enjoying it or hating it and feeling sorry for myself. 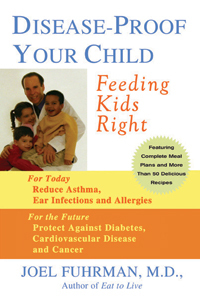 The Feb. 26 archived episode of the PCRM webcast FoodforLife is called "Getting a Head Start: Nutrition for Kids". It's not the smoothest webcast I've ever seen, but the opening play written and performed by school students is very cute. "Nutrition! Nutrition! Nutrition!" Tonight I made the Lentil Artichoke Stew they demonstrated in the webcast, and it was seriously Eat To Live-friendly and YUMMY! Using fire-roasted tomatoes really does make a difference, although I used two 14.5-ounce cans instead of the two 24-ounce cans the recipe calls for and thought that was plenty of tomatoes.